Maurice Ricci, Chairman and CEO of the Group, said: "The strong improvement in first half results in 2016 confirms the new phase of faster growth the Group has been enjoying since last year. The success of the transformation of the France business unit is remarkable. In the first half of 2016, it resulted in robust commercial momentum and a marked improvement in operating margins. This momentum is set to continue in the coming half-years. The French operations are poised to deliver best-in-class profitability in 2017, a year ahead of the Group’s initial objective. "The Group continues its move up the value chain. Its style and design activities are now all operated the under the prestigious Bertone brand. Meanwhile, the integration of Erlkönig strengthens our potential for diversification in Northern Germany and among automakers. This backs up our 2018 objectives while paving the way for the next stages of our development." - The Group recorded revenue of €550.2 million in the first half. 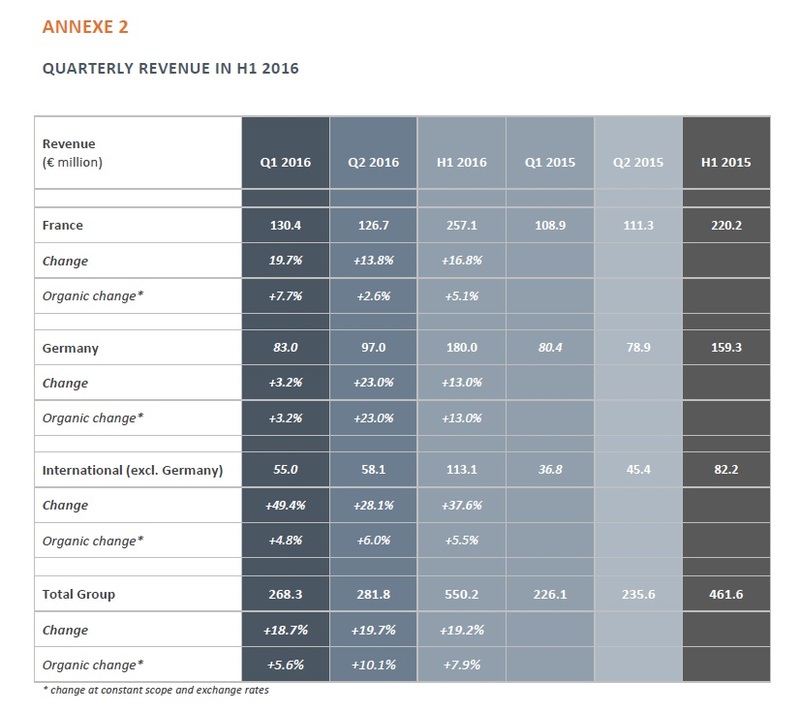 Revenue grew by 19.2%, with organic growth of 7.9% (+5.6% in Q1 and +10.1% in Q2). The Group’s three business units displayed strong momentum over the period, with organic growth of 5.1% in France, 13.0% in Germany and 5.5% internationally. - Operating profit from ordinary activities grew by 42% to €31.4 million (€22.0 million in H1 2015). The operating margin from ordinary activities accordingly recorded a 90bp improvement to 5.7%, vs 4.8% in H1 2015. The improvement is attributable to the performance of the French operations, which doubled their margin, the swift recovery of Matis and the growth of international operations, which continue to deliver double-digit margins. - Operating income was €26.2 million (+64%) after taking into account €7.1 million in non-recurring expenses resulting chiefly from the completion of the PACT 17 transformation plan, the integration of Matis and the reorganisation of the Germany BU in Bavaria. - Consolidated net income increased by 74% to €17.1 million in H1 2016, compared with €9.8 million in H1 2015. 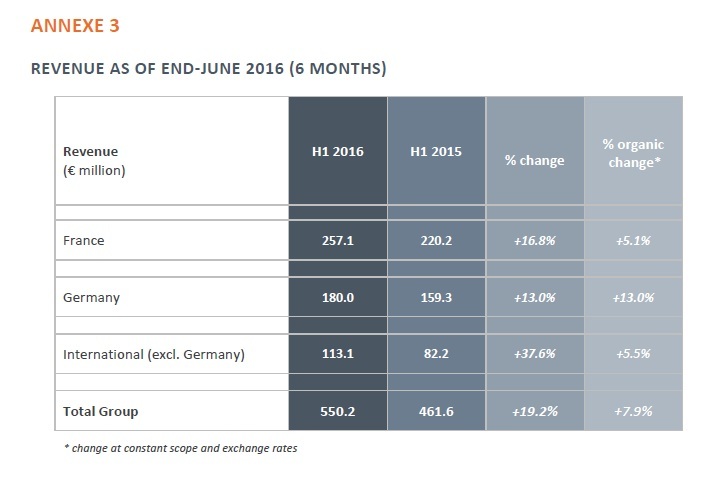 The Group’s consolidated net profit margin was 3.1% (2.1% in H1 2015). 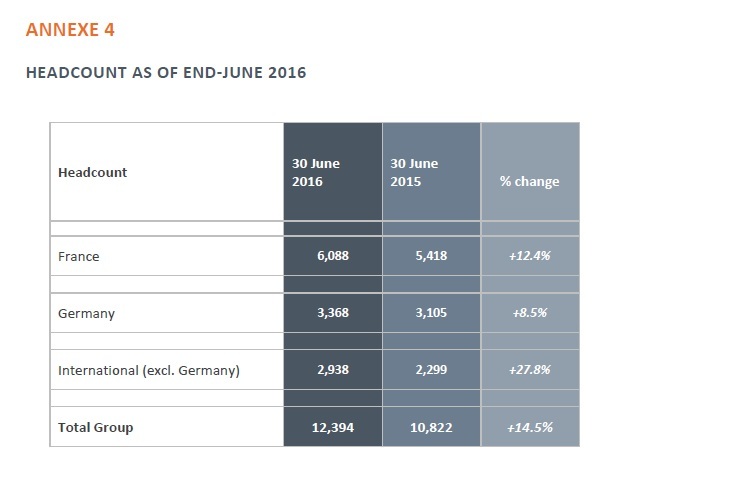 - Net debt was €141 million as of 30 June 2016, compared with €108 million as of end-June 2015 and €94 million as of end-December 2015. 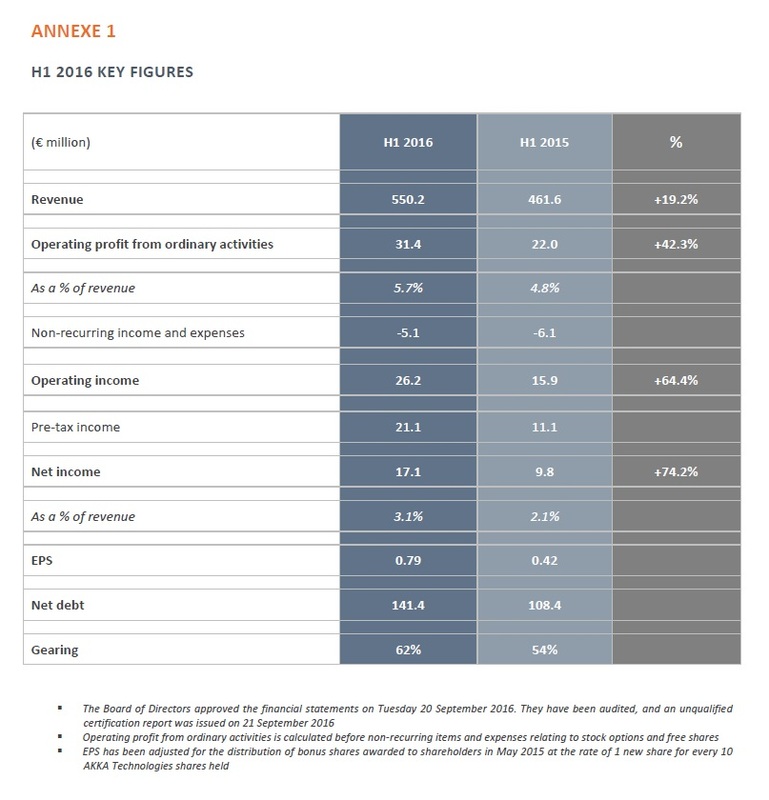 Generally negative in the first part of the year due to seasonal trends, operating cash flows were a negative €11 million, compared with a negative €33 million in H1 2015. Cash generation this year is also affected by growth in revenue, despite action that has reduced customer payment terms to 66 days, vs 75 days in the same period last year, as well as by recent acquisitions. Available cash amounted to €123 million as of 30 June 2016 following the early repayment of the €50 million drawn on the previous revolving credit facility. In conjunction with this repayment, the Group established in early July a new five-year €200 million revolving credit facility. - Gearing remains under control at 62%, vs 54% as of 30 June 2015 and 42% as of 31 December 2015. This level of gearing, available cash and the revolving credit facility of €200 million established in early July give the Group the ability to continue its policy of targeted acquisitions. France recorded best-in-class performances in the first half of 2016. At €257.1 million, its revenue was up 16.8%, with organic growth of 5.1%. In a market driven by growth in the automotive sector and a resumption of growth in the aerospace and railway sectors, the Group benefited from its position in the mobility sector and its ability to gain market share. The acceleration also reflects the effectiveness of the new sales organisation established under the PACT 17 transformation plan. The BU’s growth came alongside a rapid improvement in its operating performance. 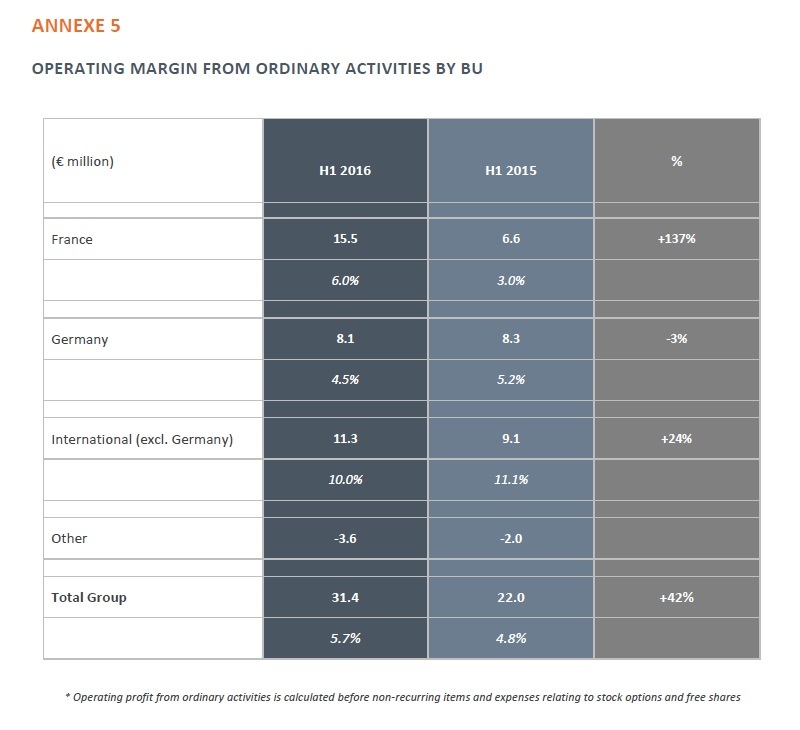 The French operations saw their operating margin from ordinary activities double to 6.0%, vs 3.0% in H1 2015. Including recurring subsidies, the margin was 9.0%. The increase is set to continue in the coming half-years, allowing the French operations to deliver normative margins in 2017, a year ahead of the Group’s initial objective. In Germany, the Group has decided to reinforce its diversification strategy by reorganising its German operations into three areas with high potential, namely Northern, Southwest and Southeast Germany. Mirroring the successful transformation in France, the aim is to reposition the offer on projects with greater value added, while refreshing the local commercial approach, which should help restore normative margins, above the Group’s. Revenue grew by 13.0% on an organic basis to €180.0 million in H1 2016. Growth was driven by the robust pace of diversification. AKKA Technologies accordingly recorded double-digit organic revenue growth with Volkswagen, Continental AG and Bosch. Operating profit from ordinary activities was stable at €8.1 million, representing an operating margin of 4.5% (5.2% in H1 2015). The margin was affected by difficulties in Bavaria, heightened competition and the ongoing reorganisation. International activities (excluding Germany) benefited from the strengthening of their positions through the acquisitions of Epsco, Corialis and Matis. Their revenue totalled €113.1 million in H1 2016, an increase of 37.6% compared with H1 2015. Organic growth remained strong at 5.5% across the first half as a whole, despite a demanding comparison base. Most countries posted strong growth with high margins over the period, despite continued commercial investments for future growth: Spain, Czech Republic, Turkey, Switzerland and the UK. The successful integration of Matis is reflected in the good performance recorded in Belgium, namely growth of 62% (organic growth of 6.4%), with double-digit margins. In total, international operations generated profit from business operations of €11.3 million, representing an operating margin from ordinary activities of 10.0%. The continued diversification of the Group’s international operations will be one of the drivers of margin improvement going forward. - Continuation of the Group’s transformation: AKKA Technologies is steadily increasing its diversification with new customers, quarter after quarter. In a dynamic market in which customers wish to increase the proportion of turnkey projects, AKKA Technologies benefits from its project expertise and its size - making it a credible partner for international companies - its innovation capacity and its international positioning. It has opened new accounts with major customers. The biggest include Northrop Grumman, PSA and Stelia, each of which entrusted their first projects to the Group in the first half. - German company Erlkönig has joined the Group: Erlkonig’s entry into the AKKA Technologies Group comes against the backdrop of the reorganisation of the Group’s German activities around three areas (Northern, Southwest and Southeast Germany). Founded in 2003, Erlkönig specialises in high value-added activities in processes, mobility and digitisation in the automotive sector. With over 270 talented employees, it posted revenue of nearly €22 million in 2015, with front-ranking margins. It operates chiefly in Northern and Southeast Germany. Its skills complement those of Auronik, and its proximity with the Volkswagen Group, its leading customer, will accelerate the diversification of the AKKA Technologies Group among German automakers. The deal is expected to close before the end of the year. The two groups have already started working together under the aegis of AKKA Technologies’ Northern Germany COO, with a view to achieving potential synergies as early as possible. - Automotive style and design activities are now all housed the under the prestigious Bertone brand, acquired in the second quarter. Since its creation by Giovanni Bertone in 1912, the illustrious Italian design house has created countless models for leading Italian automakers, including Alfa Romeo, Ferrari, Lamborghini, Maserati and BAIC. The acquisition dovetails with our strategy of expanding the AKKA Technologies Group’s offer in certain promising high value-added niches. Its aim is to accelerate the Group’s diversification in emerging countries under the auspices of a recognised and unique brand. - On 1 July 2016, the Group successfully established a new five-year €200 million revolving credit facility, on very attractive terms. It refinances early a previous €100 million credit facility maturing in 2019 and doubles the Group’s war chest while reducing its financing costs. It also enables the Group to extend the maturity of its debt while diversifying its sources of funding, by making its banking pool more international. It gives the Group greater scope to pursue its diversification in organic terms and through targeted acquisitions. - 2016: Market momentum has been improving for several quarters. AKKA Technologies is gaining market share thanks to its unique positioning. - The diversification of the German activities continues at a sustained pace. International operations continue to expand, while generating double-digit margins. France is benefiting from the success of its transformation to continue its growth, while significantly improving its margins. - The integration of Matis has been successful, resulting in a swift improvement in its positioning and operating margins. - As such, the AKKA Technologies Group confirms its target of achieving organic revenue growth in each of its three business units in 2016, combined with a further improvement in its margins. - 2018: Robust organic growth and recent acquisitions constitute a sound base for growth in the coming half years. Mirroring the experience in France, which recorded a strong improvement in margins in the first half of 2016, Germany expects its margins to improve gradually under the combined effect of the return to growth, the new organisation and the Margin Improvement Plan. - The Group also aims to pursue its dynamic external growth strategy through targeted acquisitions generating organic growth.